One of the first football games I ever broadcast on radio was McPherson High School hosting Hays H.S. This will sound crazy, I know, but I remember my headphones making me feel claustrophobic. I felt like the players, fans and band members were all part of the electric atmosphere and I was separated inside a tin can. To escape the tin can, I moved one side of the headphones behind my ear. The benefit was immediate and more than I expected. Keep reading. 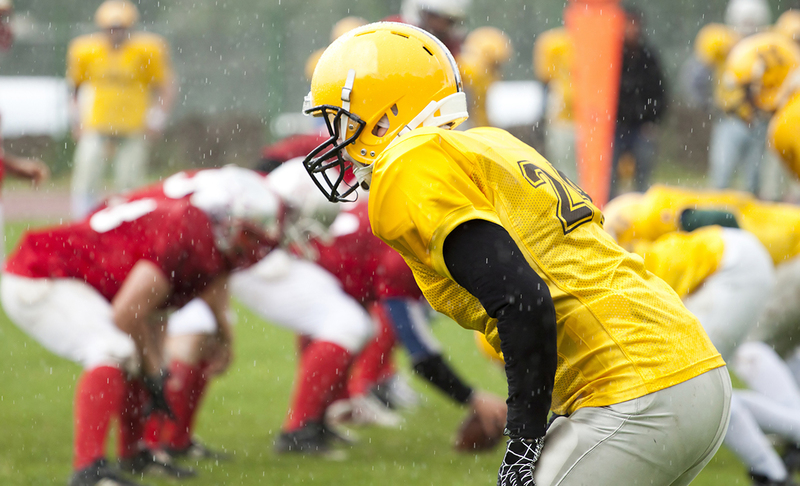 Here are four tips that will instantly improve your football play-by-play. Instead of covering both ears with your headphones, cover just one. The public address announcer will often identify tacklers before you do. You might also hear stats and other information being discussed in the press box that you can use during your broadcasts. Of course, don’t try to call play-by-play through the glasses. Between plays, though, they will help you ID kick and punt returners and guys who are checking into the offensive and defensive huddles. I was once doing a TV broadcast of a Sacramento State game. While my analyst was talking as the offense broke huddle, I noticed that the wide receiver running to the far side of the formation was Fred Amey. Moments later when the QB launched a deep spiral down the right sidline, I immediately knew he was targeting Amey. Identifying Amey in my head while my analyst was talking helped me nail the call. Give down, distance and yard (DDYL) line before and after every play. It reminds your listener of the importance of each play. The exception is if a team is going no-huddle. Then, pre-snap DDYL will suffice. What is one of your best tips for football play-by-play? Please share it below. Your advice will be of great benefit to our STAA community and be much appreciated. They make wide angle bonoculars now tvat allow you to do pbp through these. Unless you are in the press box, I dont recommend the one ear headphone method. You can hear the pa through your crowd mic. Taking the headphones suggestion another step, I don’t use them in-studio for live interviews. I monitor them by setting my headphones close enough to me to hear them, and I record those interviews in Adobe Audition so I see the volume meter. I believe that makes the interviews more conversational, because if I am wearing headphones, my guest feels compelled to do the same.